Category: Architecture - City - Landscape. 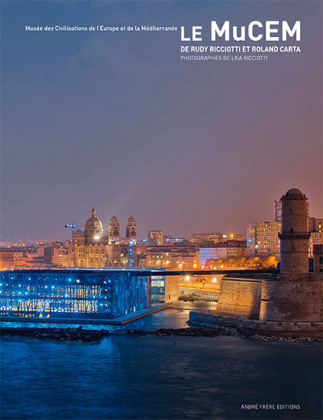 The Museum of Civilizations in Europe and the Mediterranean (MuCEM) is the only national museum established by the State in the region. “This is a project that speaks to the earth, the sea, the sky and the wind”, declared Rudy Ricciotti, who with associate Roland Carta, were chosen prize-winners in 2004 of the competition launched by the Ministry of Culture for the only decentralized national museum. In direct view of Fort Saint-Jean, he designed a naked building without clothing or adornment, encircled by latticework developed on the south and west facades and partly on its overhanging roof, fixing it in the landscape. No shiny rollover, no glued-on decorations, nor stone cladding. The building is stone itself, a fragile stone subjected to four winds. A highly refined and discreet project that fades between the Fort Saint-Jean and the Vieux-Port. The MuCEM deliberately shows the bare essential. Simple, fair, necessary, raw; the matter is minimal, glass and concrete. In this book, Lisa Ricciotti invites us with her photographs into the secrets of construction of the MuCEM, the recurrence of furrows, the sensual delight of the columns, on a vertiginous journey from the silhouette inhabited by light, to the closed and matte pores of the matter.